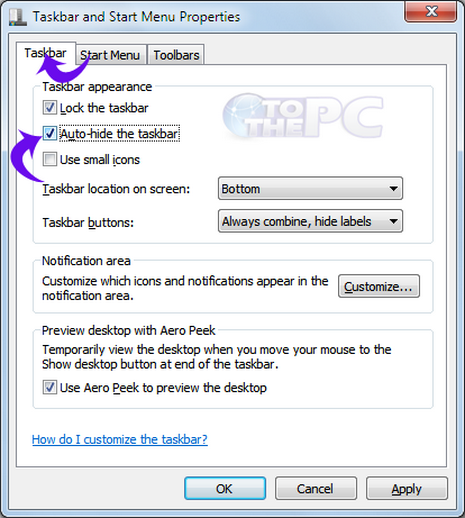 Auto hide taskbar means that the taskbar will remain hidden until or unless you take the mouse pointer over the taskbar. It will temporarily pop up taskbar and it will hide when you point the mouse pointer away from the taskbar. By default this feature is disabled in Winodws. 1. Right click on the start button and go to Properties. 2. Click on Taskbar tab. 3. Select the Auto hide taskbar option. 4. Click on OK. Now your taskbar will remain hidden untill you take the mouse over the hidden taskbar location.